FileThis is inherently secure—your documents are safe and protected at all times. But if an identity thief acquires your login and password information, he or she will have the same access that you do. Be sure to keep your account information private and use a unique password. (For details on creating a strong password, click here.) FileThis lets you change your password and other security settings any time. 1. Click Hello, [Your Name] in the upper-left corner of the FileThis window. 2. Select Settings from the menu to display the Security dialog box. 3. To specify how long FileThis should keep you logged in, select an option from the Log Me Out Automatically After menu. Tip: As with other websites that contain your personal information, you should Log Out from FileThis when you’re not using it. 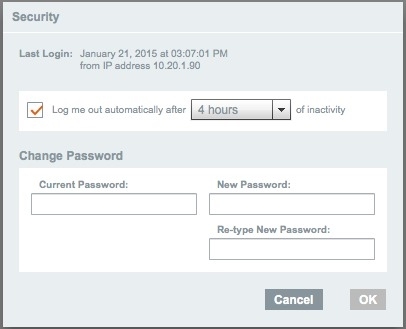 By default, FileThis logs you out automatically after 10 minutes of inactivity. You can change this to anywhere from 2 minutes to 2 days. 4. To change your password, enter your Current Password then your New Password. To confirm, retype the password. 5. Click OK. If you change your password, be sure to remember it for login purposes. 1. Login to your FileThis account and tap the menu in the upper-left corner. 2. Click the Settings button at the top. 3. If necessary, scroll down to the Security settings. 4. You can create a four-digit Passcode Lock for the FileThis app and change the password for your account here. 5. When you're finished changing Settings, return to the home screen.